A we search to spread God’s message of hope, love, service, and fidelity (to each other)—in a world currently immersed in confusion, fear and unrest—a unified vision of how to actually do this, is necessary! In July 2016 the Archdiocese of Perth shared its overarching plan for all of the parishes within the Archdiocese. 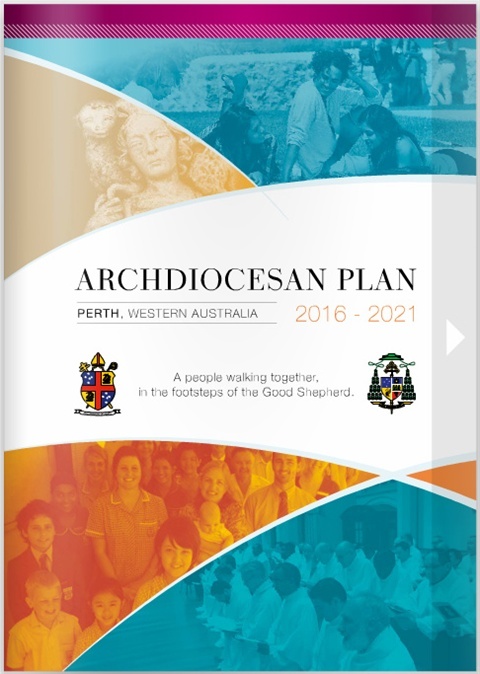 The plan is the result of extensive consultation and input from clergy, parishes, agencies, groups and individuals from within our Archdiocese. The plan is not designed to stifle creativity but to provide a fresh direction. Importantly, the Plan has demanded the review the Archdiocese from an organisational perspective. These changes have already commenced and are outlined in Section 3 ‘Implementation and Management’. The Archdiocesan plan is more than just a document. It will enable us to walk together on the pathway which we hope will deliver a Christ-centred, faithful, vibrant, welcoming, inclusive and mission-oriented Church, one which will enrich our own lives and the lives of all whom we encounter and seek to serve. The plan is not prescriptive, rather it is a positive and aspirational reference for all Catholics providing us with concrete steps to be taken as we walk together into the future.